Everyone has that one particular Christmas that they must watch every year. 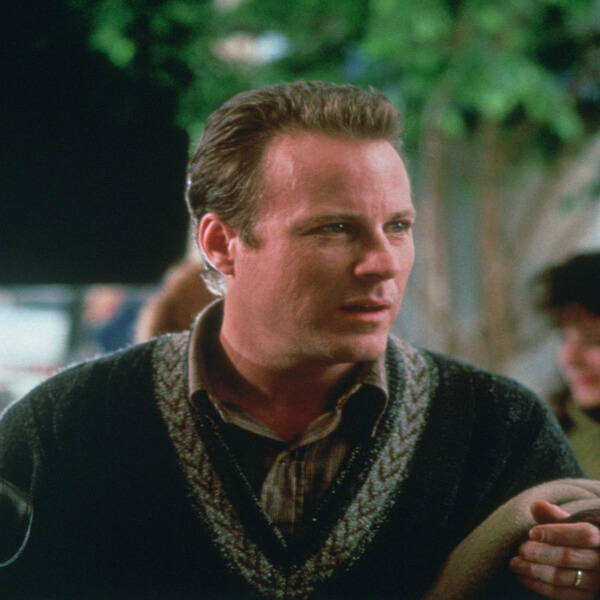 Whether it’s Christmas Vacation, Elf, or Rudolph The Red Nose Reindeer, one of the top films for the holiday season is Home Alone. The fact that an eight-year-old takes down two bizarre burglars is a treat to watch. However, no matter how many times you’ve watched the movie, there’s one thing, in particular, you probably missed. Since you likely watch it once or twice a year, here’s a quick summary. Essentially, the plot of the movie is that youngster Kevin McCallister is forgotten by his family when they leave for Christmas vacation. He’s left home to fend for himself, but it’s not long before things go from bad to worse. 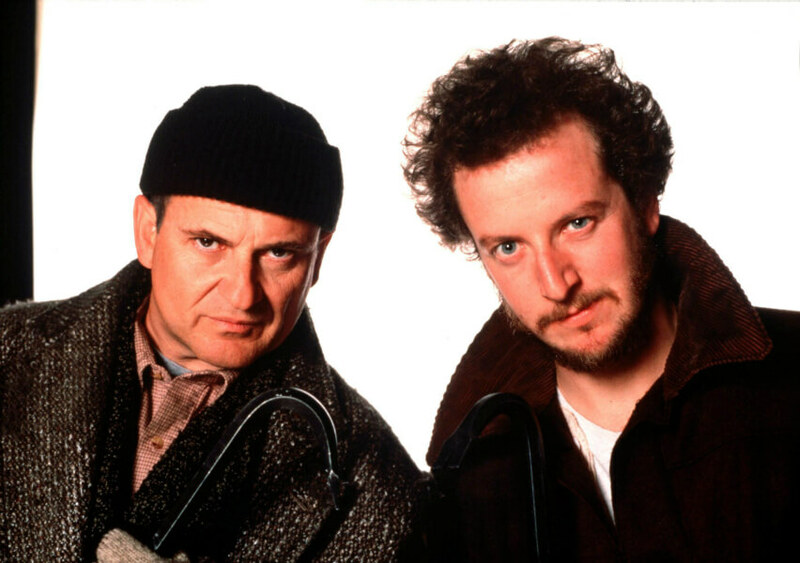 The “Wet Bandits” assume it’s an empty house, but boy were they wrong. Little did these obnoxious burglars realize, but a young kid was in the house. 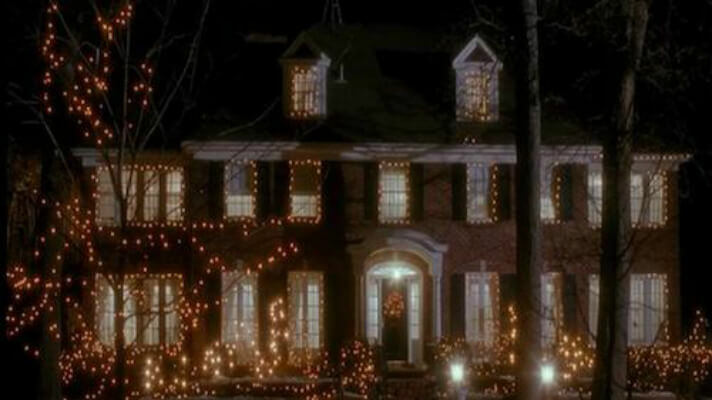 Kevin was quick to respond by setting up the empty house with plenty of creative booby traps in case they break in. While watching the movie, one Reddit user noticed something in one of the earlier scenes. Remember at the beginning when the family is packing for their trip to Paris? The pizza delivery boy brings the McCallister’s several pies and Joe Pesci’s character shows up as a cop to get a good look so he can rob it later. The family was running around trying to get organized for the vacation. They’re also trying to clean up the house while eating. We happened to miss something very important here. 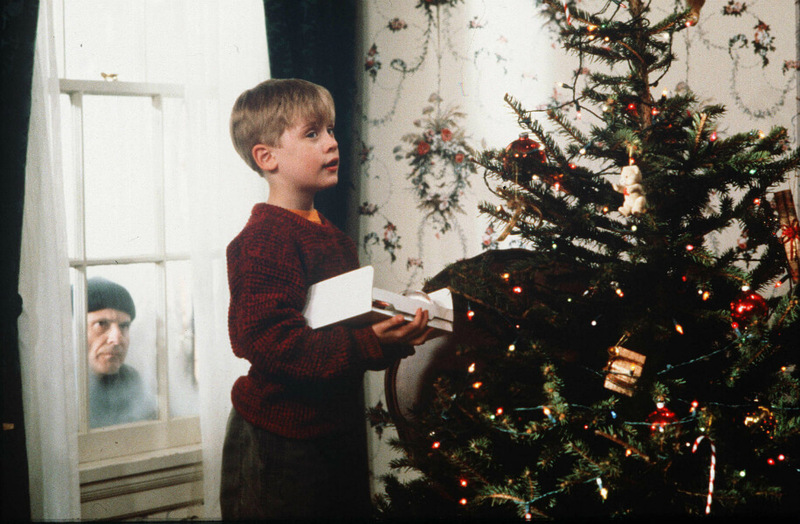 The scene in which a fiasco goes down promptly has Kevin’s dad throwing out Kevin’s ticket. All by accident, of course. 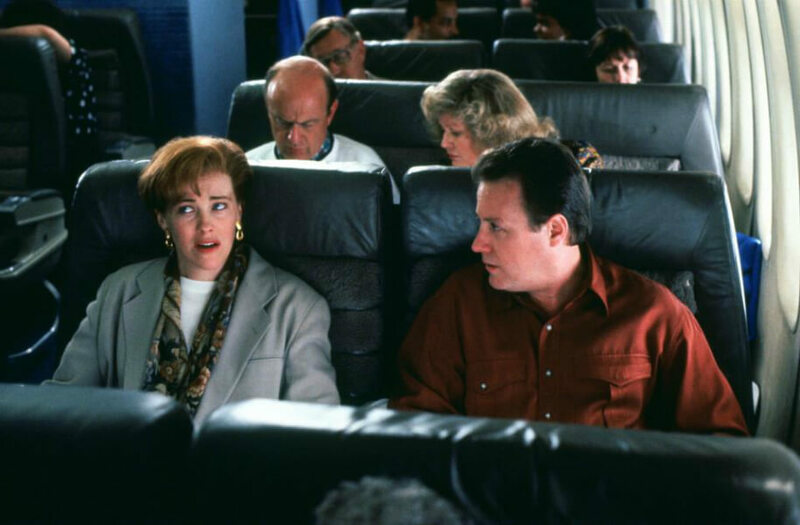 It’s a big reason why we didn’t notice Kevin’s absence at the boarding gate. It’s pretty unknown to most people which have them asking questions on social media. When the McCallisters are running through the airport, they hand the lady the tickets and she counts them as they continue on the ramp. The number of people essentially adds up to the number of tickets. That lady sure knows how to count, unlike Heather, who can’t count at all. John Hughes hired the director because of his ability to ensure every possible plot hole has an explanation and for his strong attention to detail. However, one Redditor did mention that everything from the ticket being thrown out and Kevin sleeping alone upstairs boils down to one thing. Essentially, Kevin did NOT want a pepperoni pizza. His insistence on having a cheese pizza instead caused his older brother, Buzz, to annoy his younger sibling, causing Kevin to get upset and throw a fit. If you’re blown away by this new theory, now is the time to watch the movie again. Oscar-winning screenwriter, William Goldman, wrote a book called The Big Picture: Who Killed Hollywood? And Other Essay. 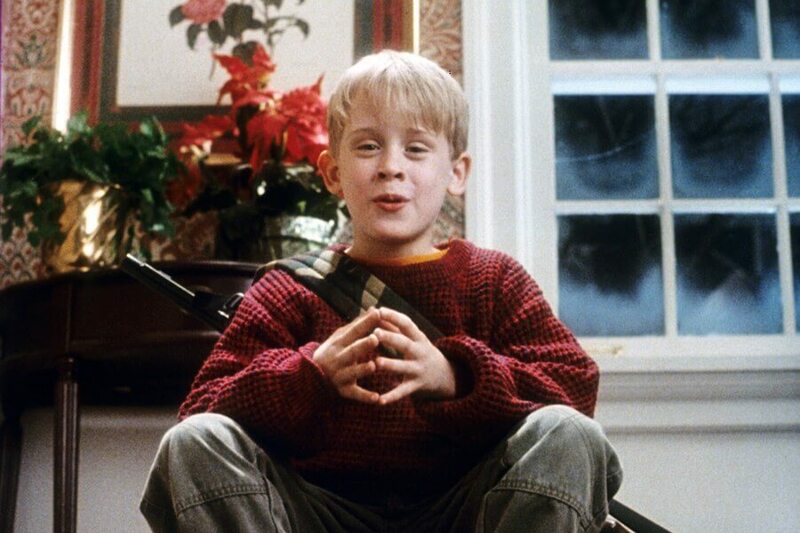 The two-time Oscar-winner admitted that the surprising success of Home Alone contributed to a new phrase to Hollywood. 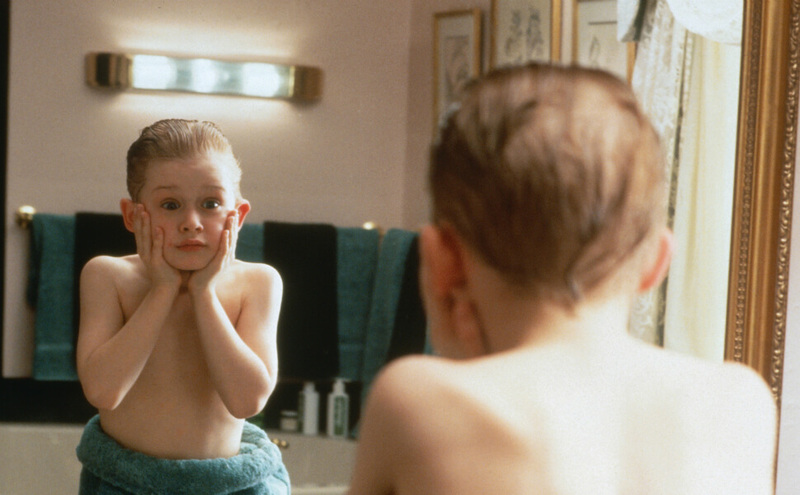 To ‘Home Alone’ means that other films suffered at the box office thanks to the films long and magical run. You’ll never guess which European country has the biggest obsession over this film! 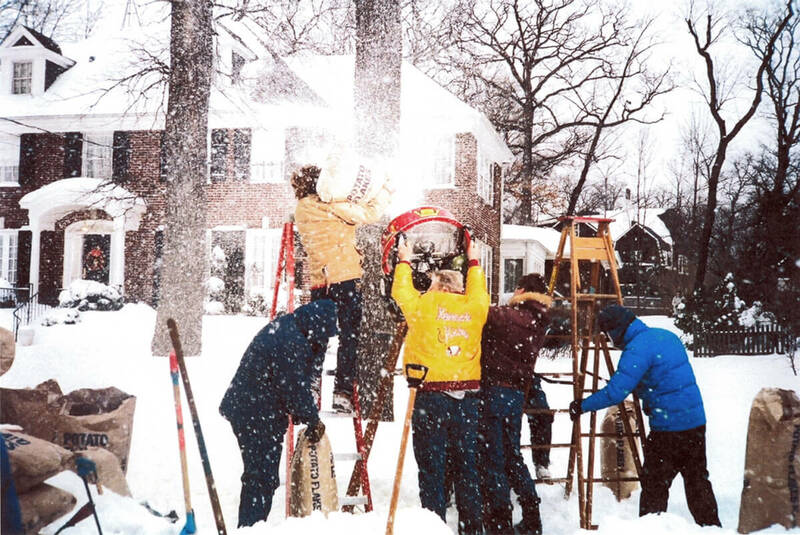 The home is located at 671 Lincoln Avenue in Winnetka, Illinois. The main staircase, kitchen, and ground-floor landing are seen in the film. They were all shot in this five-bedroom residence. But, in 2012, John and Cynthia Abendshien, who owned the home at the time, sold the property for $1.85 million. 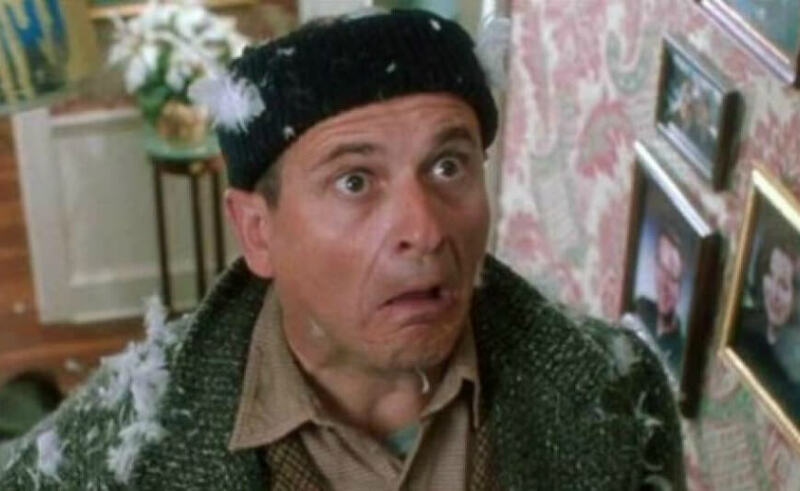 Interestingly enough, Home Alone became a holiday tradition out in Poland. The film has been aired on national television since the early nineties, with the popularity increasing over time. In 2011, more than five million people tuned in to watch it, making it the most watched show during the holiday season. The one actor who co-starred with Joe Pesci in Casino turned down a role for this movie. With the movie being released in over 1,200 theaters, it made over $17 million in its first weekend. Eventually, the film would maintain the number one spot for 12 consecutive weeks. It even remained in the top 10 until June 1991. That helped the movie earn its World Record as the highest-grossing live-action comedy ever. The production was shot entirely within the Windy City. Supposedly, some scenes were at Paris-Orly Airport were shot at O’Hare International Aiport. Those fancy business class seats during the flight? Those were built on the basketball court of a local high school. It’s the same school as the scene with Kevin running through the flooded basement. The Goodfellas actor turned down the role that would go to his co-star, Joe Pesci. But, here’s another interesting fact behind Pesci’s character. Harry is actually based on actor Orson Welles. The only reason why he’s named after Welles is because it was the name of his character in Carol Reed’s, The Third Man. 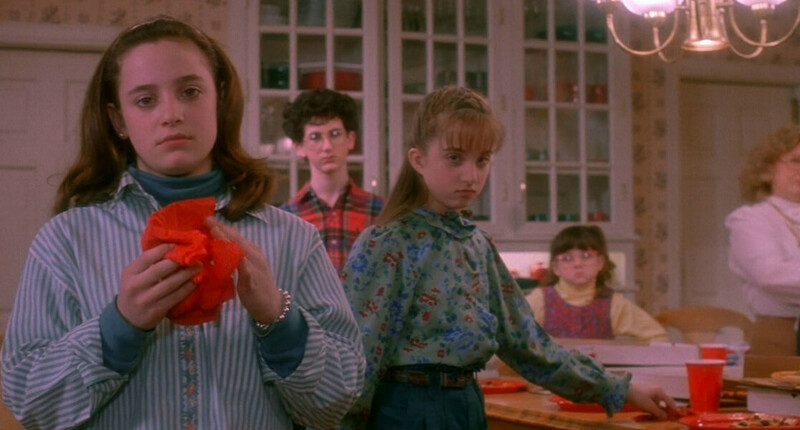 Surprisingly, there was more than one Culkin who appeared in the movie. Stay tuned to find out who that is! In 2013, Columbus told The Guardian “I was much younger and I was really too naive to think about the family environment as well. We didn’t know that much about the family at the beginning; as we were shooting, we learned a little more. The star of My Cousin Vinny did his best to avoid the youngster on set. It was his way of making sure the child star would be afraid of him. 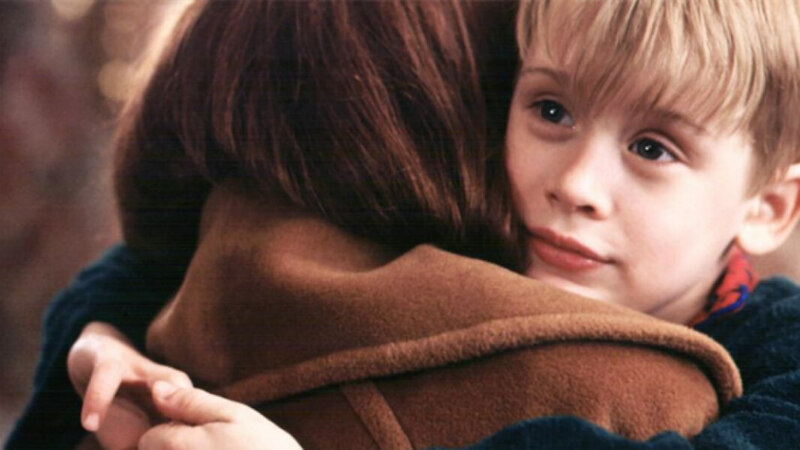 No one would blame Culkin for being petrified, as he still bears the physical scar from one accidental altercation. When rehearsing one scene, Pesci bit his finger, breaking the skin. 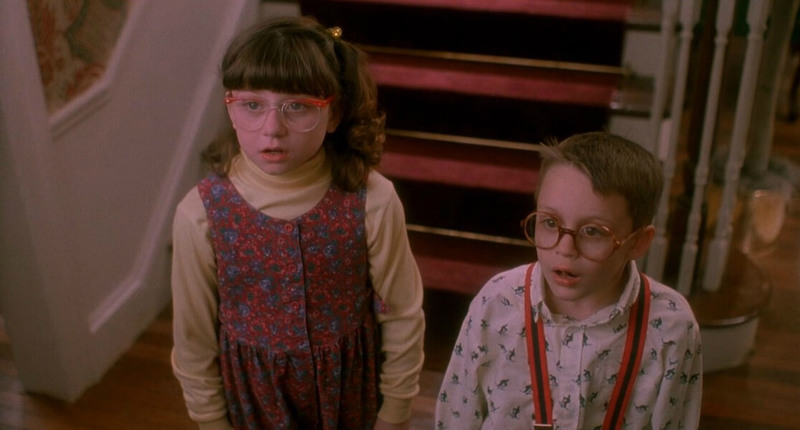 There were two Culkin’s in the first movie. Macaulay’s younger brother, Kieran, also scored a part in the film. 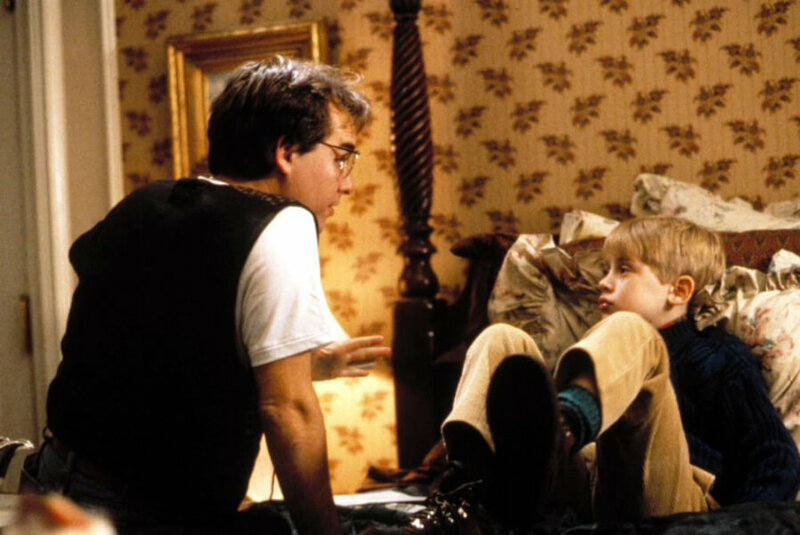 Although it was just a minor character role, he played Kevin’s cousin, Fuller, the bed-wetter. 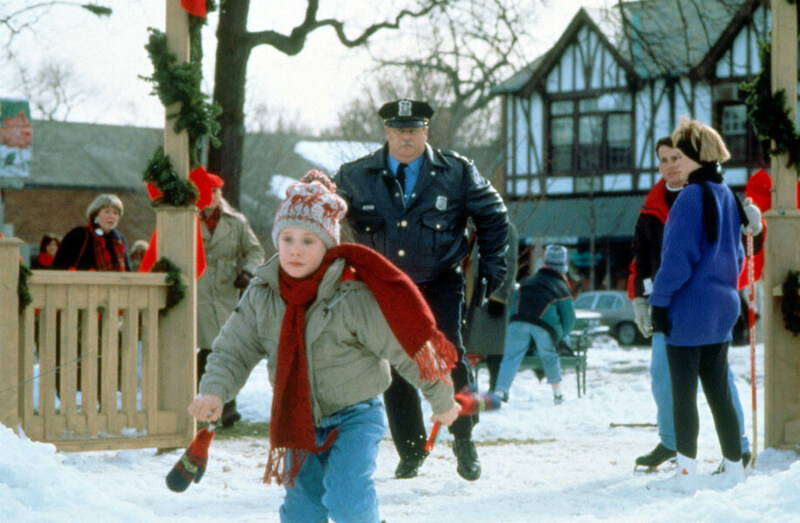 The film would mark the acting debut for the younger Culkin. He would go on to appear in Scott Pilgrim vs. The World and Fargo. 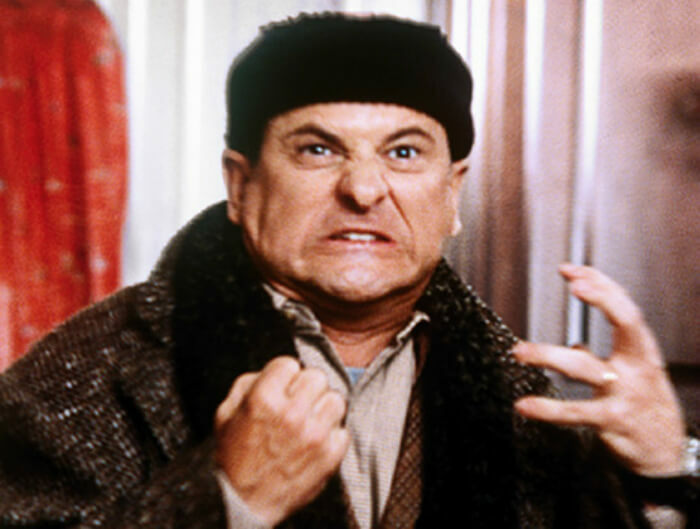 Read ahead to see why Joe Pesci wasn’t used to doing this type of movie. However, the role didn’t stop Columbus from auditioning over 100 kids. 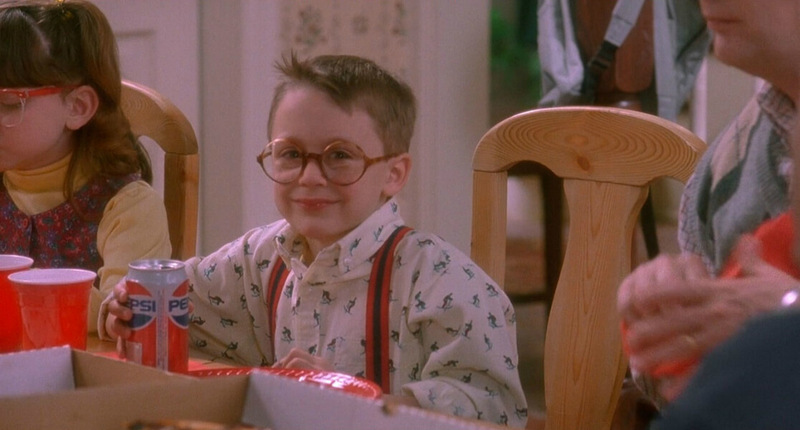 But in the end, Culkin would win the role of a lifetime. It would be hard to imagine seeing some other child actors play the iconic role. Maybe Leonardo DiCaprio, but he had his role of a lifetime with Titanic. 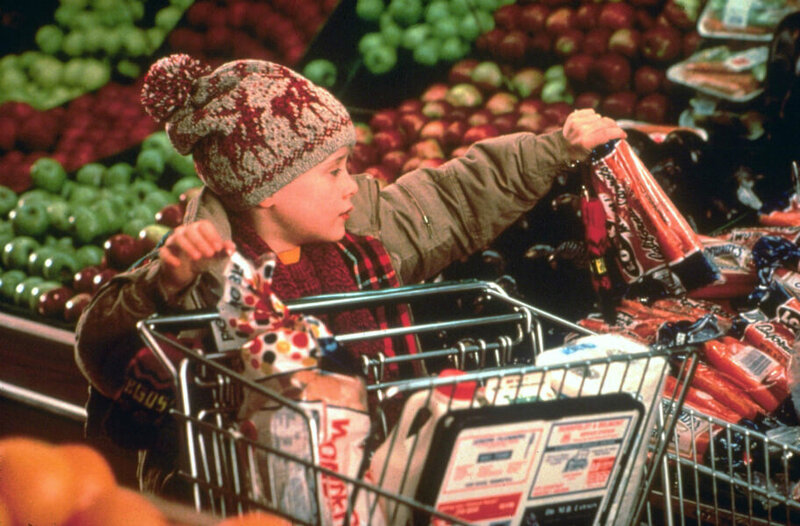 All of the main, original cast members reprised their roles in Home Alone 2: Lost in New York. Columbus would take the directors chair once again for the sequel. But, the success of the original film led to a full-on-franchise. Now there are four sequels, three video games, a novel, and kid-friendly merchandise. Can you blame the Academy Award winner? He had some very ruthless roles in The Goodfellas and My Cousin Vinny. 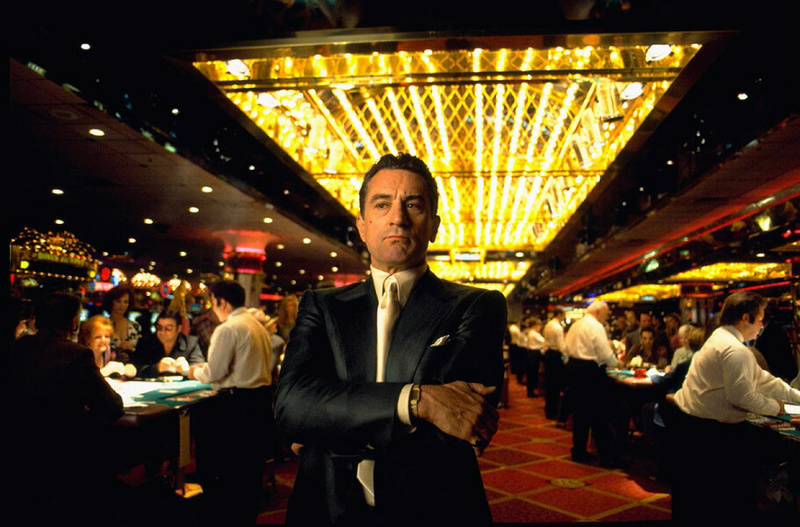 Oh, and Pesci fans can’t forget about Casino or Raging Bull either. So, it’s very understanding as to why the actor didn’t feel comfortable with the whole PG family-friendly atmosphere. Remember all of those booby traps Kevin set up? Read ahead to see the harsh reality if it happened in real life. 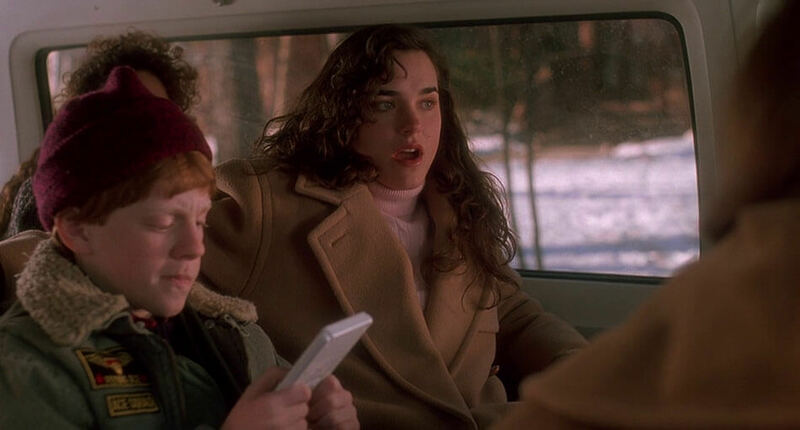 The idea for Home Alone came to John Hughes. 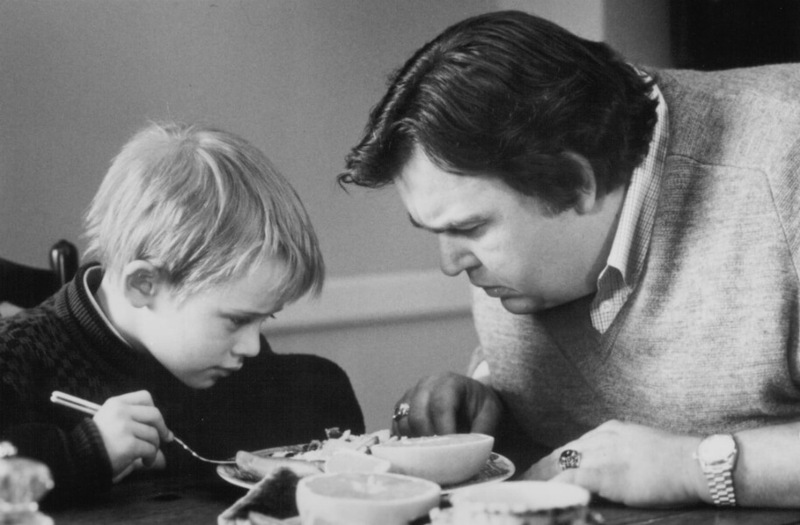 The late director was making Uncle Buck, which also starred Macaulay. There was one scene in which his character interrogates a potential babysitter through a mail slot. 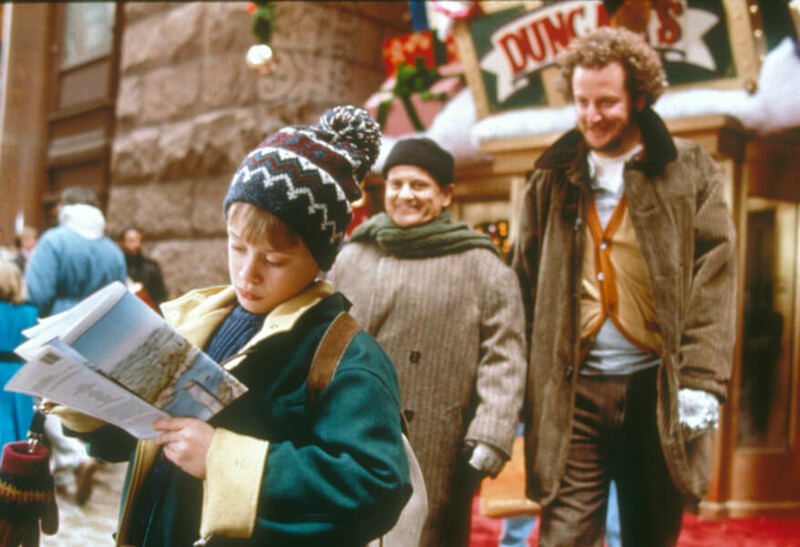 Fast forward to Home Alone, where Culkin appears to have a confrontation with Daniel Stern, but through a doggie door. Stern had a four-letter word slip-up while filming on set. Interestingly enough, it was not cut out of the film. He utter the word s*** when he attempted to retrieve his shoe through the doggie door. If you really want to hear him utter the swear, look for it at the 55:27 mark on the DVD. Okay, so BB gun shots to the forehead and groin are one thing. A steaming hot iron and a can of paint to the face is another one too. 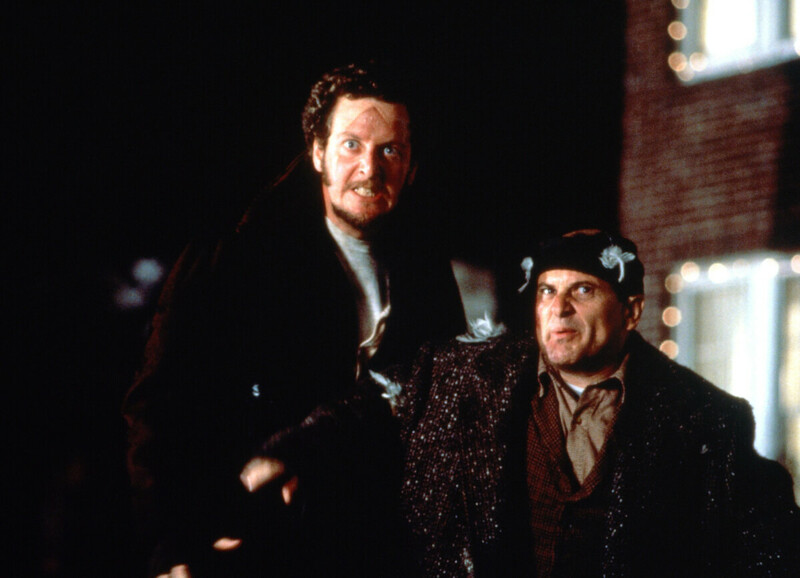 The Wet Bandits sure did face a ton of violence from an eight-year-old. It was so bad, that if this was in real life, neither one of them would be walking at all. 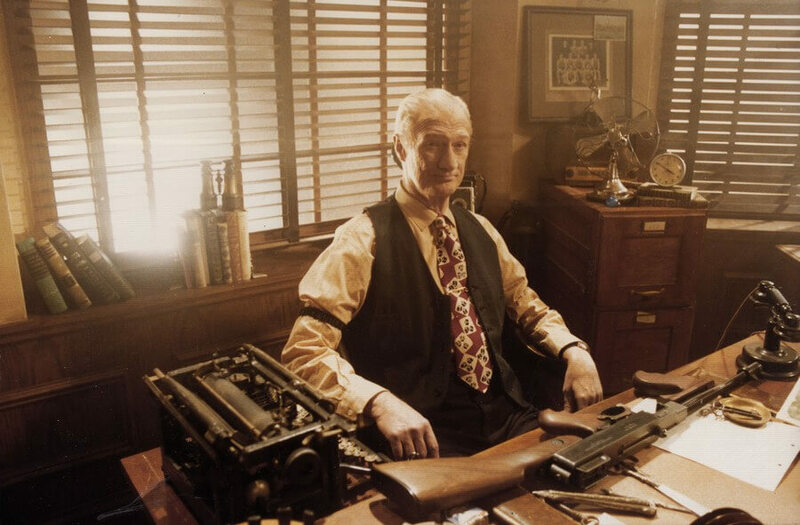 Read ahead to see which crucial character was never added in the original script. 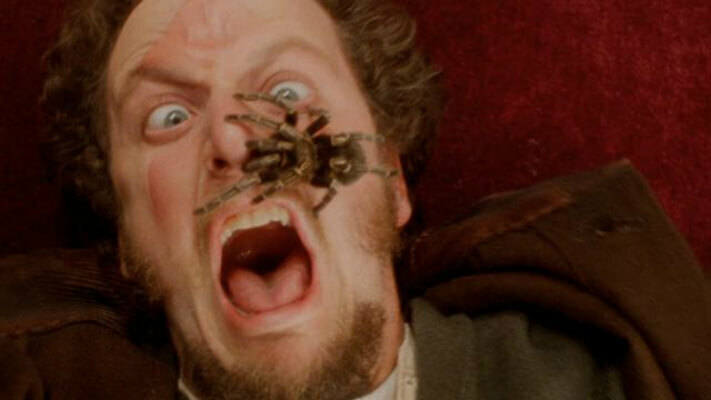 Near the end of the movie, Kevin places Buzz’s tarantula on Marv’s face. 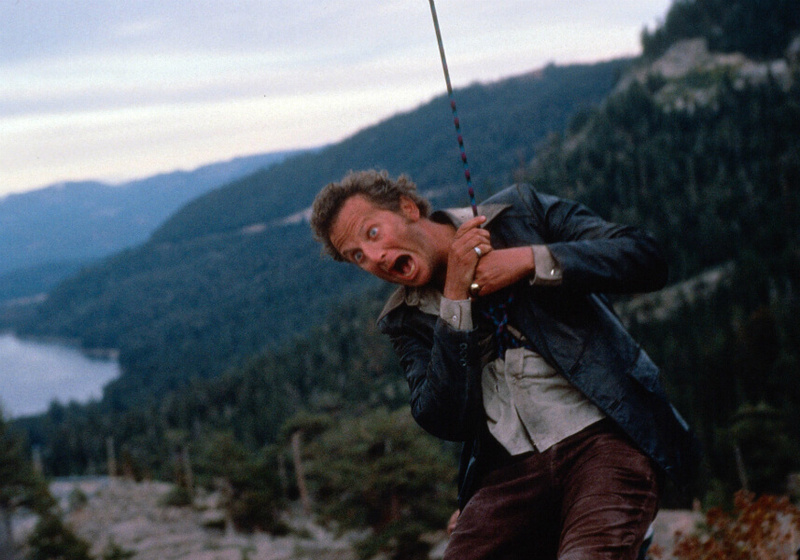 It was a real spider and even Daniel Stern agreed to let it happen too, but for one take only. The only thing that wasn’t real was the scream. In order to not scare the spider, Stern mimed the scream. You would think they’re real, but the Jimmy Cagney-like black-and-white gangster film is hard to come by. You can’t even search it on eBay because the movie is NOT real. Nor is the sequel, Angels With Even Filthier Souls, which appeared in Home Alone 2. Unfortunately, it is fake as well. The supposedly scary neighbor wasn’t a character in the first script. 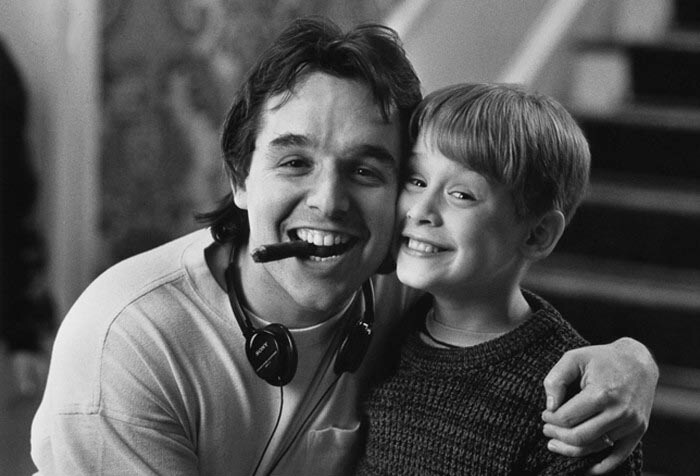 Of course, Marley’s role was important as he taught Kevin the importance of family. Eventually, Columbus would add the character into the movie, because he thought that the film could do with a stronger dose of sentimentality. Another conspiracy theory is still on the way. But, it has to do with the King of Rock n’ Roll. After the movie finished filming, the production crew donated some of the artificial snow to the Lyric Opera of Chicago. The stuff that’s made from wax and plastic was given to the Opera after it was used in a variety of their productions throughout filming. There’s not one hit movie would be complete without a great little conspiracy theory. The case made in this holiday movie is that the King of Rock n’ Roll makes a cameo. However, Elvis died in 1977. 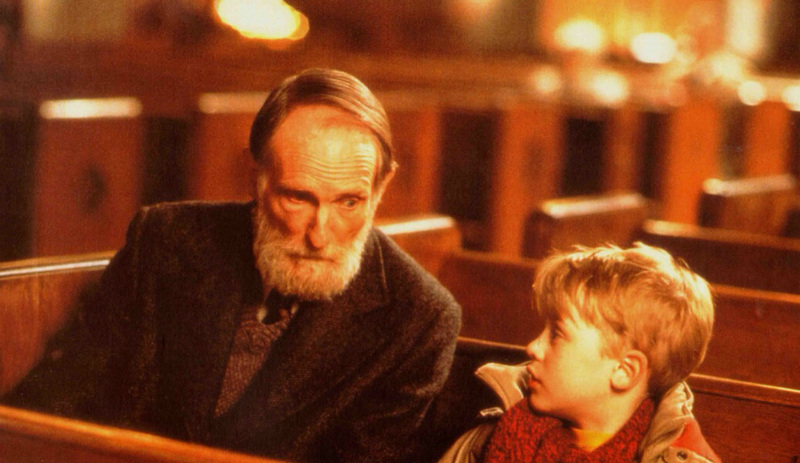 Yes, that’s right, according to Home Alone conspiracists, the King is alive and well. Greg Beeman’s film Bushwhacked stars Daniel Stern. He plays a delivery guy on the run after being framed for murder. Surprisingly, this was supposed to be the spinoff of Home Alone. The storyline would have been the same. After giving up the life of crime, Marvin would have been framed for murder.